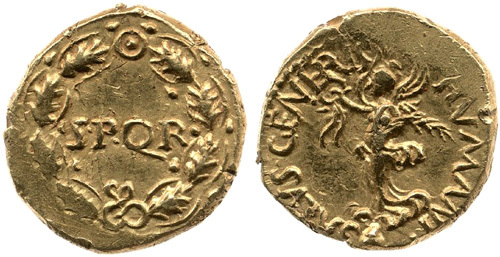 During the Civil wars, A.D.68-69, many coins were struck without the portrait or title of an emperor. Cohen gives them a supplement to Galba; BMC and RIC give them a special chapter and add some of those that Cohen gives to Augustus (as they bear his name). Obverse: No legend. Minerva bust right, helmeted and draped, with aegis. Reverse: SECVRITAS P R Securitas, in long tunic and with cloak over right shoulder, seated right on throne, head resting on right, left holding sceptre; in front, garlanded altar. 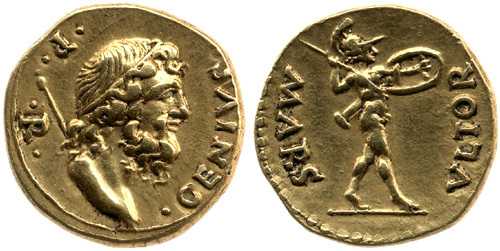 Obverse: GENIVS P R, Bust of Genius, bearded and diademed, right; behind, sceptre. Reverse: MARS VLTOR Helmeted Mars, unclothed, advancing right, right brandishing javelin, shield on left arm, parazonium at left side. Obverse: MARS VLTOR, Mars bust right, bearded, helmeted and draped. Reverse: SIGNA (in exergue), P-R to left and right of aquila between two standards; altar to right of aquila. Obverse: SALVS ET LIBERTAS Helmeted female figure standing right, holding long vertical spear in right hand and left hand resting shield on ground. Reverse: S P Q R in oak-wreath. 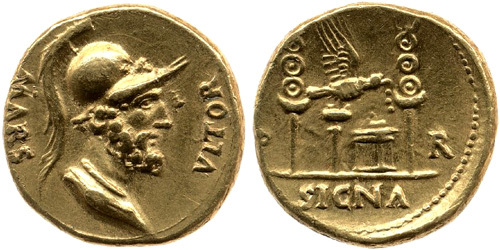 Obverse: SALVS GENERIS HVMANI, Victory standing left on globe, right holding wreath, left palm. Obverse: Augustus head right, bare. Reverse: AVGVSTVS below capricorn right, holding globe to which rudder is attached; above, cornucopia. Obverse: DIVVS AVGVSTVS, Augustus head right, radiate. Reverse: PAX, Pax standing left, holding caduceus in right hand, corn ears and poppies in left.